The social network has plenty of levers it can pull to grow sales. 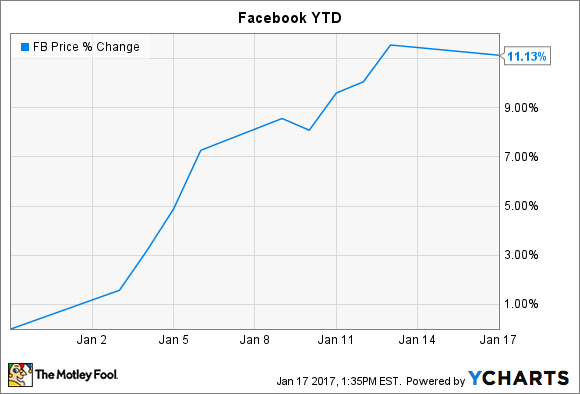 Social network Facebook (NASDAQ:FB) finished off 2016 with a couple of rough months. November was a terrible month thanks to a trifecta of bad news: earnings, the fake-news controversy surrounding the election, and weaknesses with Facebook's video analytics. The good news for investors is that shares are starting off 2017 with a bang, with shares putting up a strong recovery and gaining 11% within a matter of weeks. Of the three November events, third-quarter earnings were by far the most meaningful. While the results themselves were fine, what spooked investors was the company's guidance for 2017. Specifically, CFO David Wehner warned that "ad load will play a less significant factor driving revenue growth after mid-2017." Combined with the company's plan to invest aggressively in the business throughout 2017, investors were worried about Facebook's ability to perform with both the top and bottom lines. I've already made the case that this will play out just like it did in 2014, where shares dipped on almost identical remarks only to subsequently soar to new all-time highs. At least one Street analyst agrees with that assessment. Last Friday, Raymond James analyst Aaron Kessler upgraded his rating on Facebook (via Tech Trader Daily), from outperform to strong buy, in part because he believes investors are overly concerned about Facebook's ad load. There are the other factors that Wehner had mentioned as important contributors to revenue growth (user growth, increased time spent, and increased advertiser demand), and Kessler is confident that continued strong performance in these areas can help offset any deceleration in ad load growth. Analysts are expecting Facebook to put up revenue growth of approximately 35% for 2017, a natural deceleration from the roughly 55% growth that Facebook is expected to post for 2016 (fourth-quarter results aren't due out until Feb. 1). The fear is that Facebook falls short of 35% growth for the year if it takes a more measured approach to ad load for the sake of user experience. But Kessler thinks that growth target is "very achievable," thanks to strong expected performance in the other areas that contribute to Facebook's top line. Specifically, Kessler is modeling for 12.5% growth in daily active users (DAUs), a 6.5% bump in time spent, and a 6.7% increase in ad prices. The analyst estimates that ad load will grow by a more modest 4.5%, down from 13.5% ad load growth in 2016. Spending at social ad agencies continues to rise (in the range of 20% to 30%), and Facebook continues to attract strong advertiser demand as it hones its ad targeting. The overall social ad market remains strong, and Facebook stands to capture most of that growth as the dominant social media platform. Kessler is maintaining the same price target of $160, which represents considerable upside even relative to the all-time high of $133.50 that Facebook set late last year before the November sell-off.